Don’t reach for another cup of coffee or a caffeinated soda when your energy levels are lagging. It may be that your body is yearning to be replenished with the essential nutrients in the Geritol® Liquid formula. 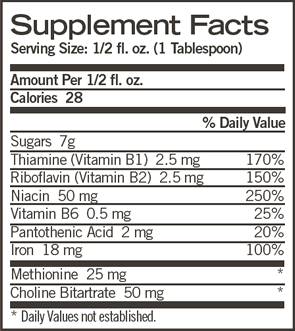 B-vitamins aid in your body’s metabolism process, turning food into fuel. And iron is necessary in your blood to help move oxygen throughout your body. Sometimes your body needs a little extra. Find out why so many generations choose Geritol® Liquid for energy support. This convenient liquid formula combines essential B vitamins and an iron supplement in an easy-to-swallow liquid to help you out when your energy levels are low. Ingredients Invert Sugar, Purified Water, Alcohol 12%, Brewers Yeast, Ferric Ammonium Citrate, Caramel Color, Choline Bitartrate, Niacinamide, Citric Acid, dl-Methionine, Thiamine HCl, Riboflavin, d-Panthenol, Flavors, Benzoic Acid, Sodium Hydroxide, Pyridoxine HCl. Directions: Use dosage cup enclosed. Shake well before using. Adults 12 years and older: 1 tablespoon (1/2 fl. oz.) daily after a meal, or as directed by a doctor. Not intended for children under 12. Do not store above 25°C (77°F). Protect from freezing.